The weather dictates everything Elyse Wise does. Her day can change in seconds. On this occasion, as she walks around Uterne, the largest solar farm to supply power to Alice Springs, the sun is beaming down on her, doing its job. Uterne, which means “bright sunny day” in the local Arrente language, is living up to its name. It’s one of the best places in the world to develop this renewable energy, because the Northern Territory gets more year-round solar radiation than many locations globally. 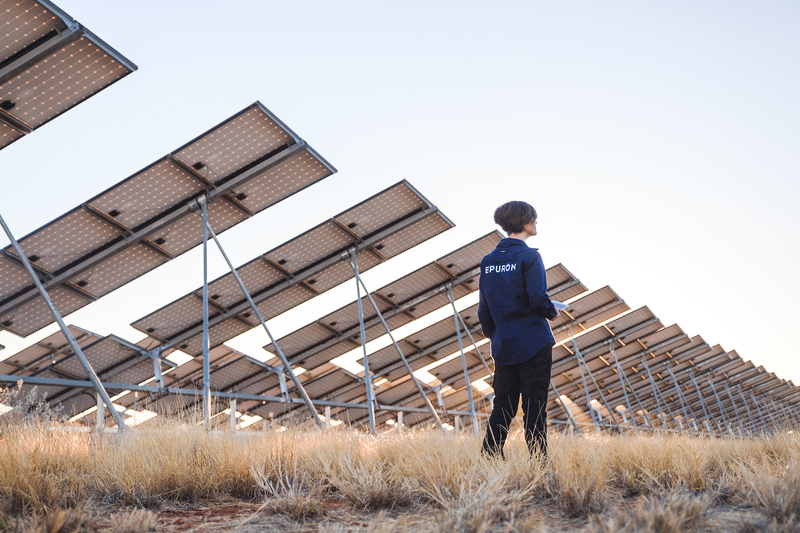 After joining Sydney-based renewable energy company Epuron in 2014, Wise took her first trip to the solar farm in 2015. “The first thing that blew me away was just how red everything was … it looks completely different to any other part of Australia. I spent the first few hours taking photos,” she recalls. Wise manages projects from Sydney and visiting regularly as a fly-in, fly-out worker to see plans implemented correctly. It has since become her second home. Wise played an integral role in installing CloudCAM technology, developed with their partners Fulcrum 3D and tested at Uterne. The technology, which provides live weather-based solar performance signals, “After a few site visits I grew in responsibility to understanding how the sites needed to be maintained and how to keep the systems running and what the contractual agreements were,” Wise explains. After installing and reporting on CloudCAM, which makes weather-based solar performance predictions, her rise up the ranks was fast. Wise is now the solar asset portfolio’s second-in-charge. The role requires her to manage the development of projects, find land and establish operational costs. Wise’s love of renewables energy and her belief in the potential is palpable: “of the renewable technologies that we’ve got, it’s one of the easiest to develop. It’s got very few moving parts, it more or less runs itself,” she says. “Solar is going through a really exciting time at the moment,” Wise points out. The portfolio is growing thanks to 2020 renewable energy targets and improved solar panel pricing. Plus, Wise’s CloudCAM work gives Epuron a bright future in the NT. It’s among the most innovative solar technology developments in the world. CloudCAM captures images of the sky every few seconds and delivers messages to solar sites to indicate how much power is likely to be produced in the coming minutes. “We can turn that into warning signals for the grid or for extra supplies like batteries that might need to kick in to keep the supply stable,” Wise explains. Uptake of solar continues to grow in the Northern Territory. The City of Darwin installed solar panels at Casuarina library, Casuarina pool and Nightcliff pool. Darwin’s military museum also has a significant solar system. Residents are increasingly opting for solar, too. “You can see a huge push on the social level of people who are turning towards renewables,” she observes. Which is why there’s plenty of exciting work for Wise and her team in the pipeline. In addition to Uturne, which powers 1000 homes in Alice Springs, there are solar stations in Ti Tree, Kalkarindji and Lake Nash. which supply 80 percent of power to the indigenous communities they service. Currently, Epuron is responsible for approximately seven megawatts of power produced through Northern Territory farms and future projects will increase the output. The Katherine solar project, a 25-megawatt site will be her most challenging and rewarding opportunity yet. Spending time on the farms provides an appealing contrast to her Sydney home. Wise is captivated by the Northern Territory spirit. “There’s elements of the outback adventure style that I don’t think should ever be taken out. It’s also inclusive and full of great people,” Wise says. More than three years after her first visit, it’s still as thrilling to arrive in the NT as it was the first time. There’s nothing like hitting pause on her city life and taking the dirt roads to visit solar sites. There’s not a building in sight and cloudless blue sky stretches all the way to the horizon. The extraordinary landscapes fresh air and sunshine, make it an enviable workplace. “It’s always an adventure. It’s like a big camping trip,” she says.